3500MP, Solid-State Pre-amp from Moon Professional. At the San Francisco Audio Engineering Society (AES) conference, Simaudio started shipping their new “Moon 3500MP” Mic Preamp. The new 3500MP is a solid-state two-channel mic preamp designed to deliver extreme detail, with an open and neutral sonic transparency, allowing the engineer to showcase the colorizations of their microphone choice instead of the preamp. 2 independent audio channels, each on separate printed circuit boards. Gain range of 8.0 to 66dB with -3.5dB of variable output trim. Metal film resistors and polypropylene film capacitors; No electrolytic capacitors in the signal path in non-phantom mode. 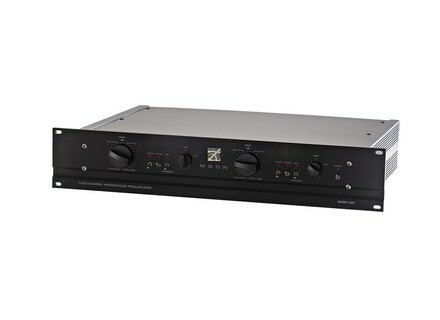 Built-in Power supply using 2 ‘toroidal’ transformers (1 for the audio signal circuits; 1 for 48V phantom and control circuitry), housed in an isolated enclosure constructed from satin coated 14-gauge steel. 24-position gain potentiometers featuring gold-plated contacts and thin surface-mounted film resistors with 1% tolerances. Visit www.moon-professional.com for more details. [AES] Firmware Rev 5 for Lynx Hilo Converter The latest firmware release for the Hilo Converter System from Lynx Studio Technology, Version 5, is set for release in late October. [AES] iZotope Tech in Blue Mics Tiki iZotope has partnered with Blue Microphones to develop Tiki, a USB microphone designed to mimic the intelligence of human hearing. Rycote ORTF Windshield Kit Rycote has announced a new Windshield Kit product, designed for stereo recording with a matched pair of microphones in an ORTF configuration.